Prices for iPad 2 3G models have begun appearing on the Chinese Apple Store website, reports Sina Tech. The prices were discovered by performing a search for ‘3G iPad 2’ on the site, although the products are unable to be ordered as of yet. The iPad 2 models with 3G have yet to launch in mainland China, making the devices a hot target for smugglers looking to bring them over from Hong Kong for a profit. Products imported officially from Hong Kong are subject to a 17% VAT and HK has no sales tax, making it an ideal place to score cheaper product and ‘export’ it. 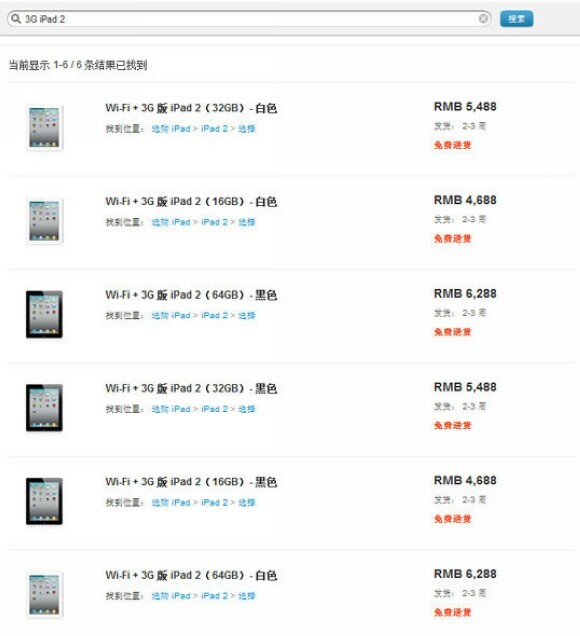 But from the pricing, it looks like the Chinese iPad 3G models will be very reasonably priced when compared to Hong Kong and US prices. It looks like a 16GB iPad 2 will run you RMB 4,688, which is right on par with the US version which runs RMB 4,300 (converted). The Hong Kong price of RMB 3,910 is still cheaper because of the VAT but it should be close enough to alleviate some of the smuggling issues. While the products aren’t showing up as available to order yet, the search shows a shipping date of ‘2-3 weeks’, so hopefully Chinese consumers will soon be able to snag a reasonably priced iPad 2 3G without having to resort to smuggling.